I need to listen to more V-103. This is in the way of a small confession. One of the few surprises in Georgia ballot tallies on Tuesday was the startling support given by African-American voters to Amendment One, the measure to permit the state to create a commission that will directly license charter schools. This despite a very loud continent of black lawmakers, not to mention the state Democratic party and the Rev. Joseph Lowery, who declared the proposed constitutional amendment would result in the resegregation of public schools. What I didn’t know – and neglected to discover until Wednesday — was that these voices were being drowned out by the biggest name in black politics: President Barack Obama. *Woman No. 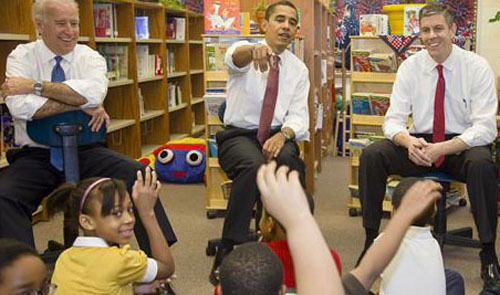 1:* President Obama supports public charter schools. *Woman No. 2:* Many Democrats in this state support public charter schools. But Amendment One shouldn’t be about Democrats or Republicans. *Woman No. 1:* It shouldn’t be about local politicians trying to further their careers. It should be about providing every child with a real education opportunity. You should vote “yes” on Amendment One. *Woman No. 1:* Then you should vote “yes” for Amendment One. *Woman No. 2:* Vote “yes” for public charter schools. Never mind the content, which opponents of the ballot issue might argue was off-base. Amendment One wasn’t about whether charter schools should exist — it was about who would be in charge of creating them. Even so, the Obama radio ad was deemed crucial. Amendment One passed with 59 percent approval, earning nearly 100,000 more votes than Republican presidential candidate Mitt Romney. Franklin and Carpenter worked with GOP strategists Heath Garrett, Chip Lake and Mitch Hunter for the well-funded Families for Better Public Schools, the lead organization behind Amendment One. In early October, polls showed black support for the charter school measure slipping. A TV and radio ad, featuring a young African-American student at Ivy Prep was rolled out. “We wanted to say, ‘This is who you’re voting against,’” Franklin said. Much of the opposition was pushed into the undecided column. The ad featuring strung-together comments that Obama has made on charter schools was used to turn black voters into supporters. “The point of putting Obama up there is that I knew the other side would make it partisan,” Franklin said. The ad began running Oct. 29 – once an hour on every African-American radio station in Atlanta, and three times every two hours on stations throughout the rest of the state. “We took the exact opposite approach that the T-SPLOST took,” Franklin said. With the transportation sales tax campaign, emphasis was placed on obtaining personal endorsements from black leaders – most prominently Atlanta Mayor Kasim Reed. Who remained silent on Amendment One. “What I’m most proud about this win is, was not only that we won the black vote 2-1 against the black establishment, but we did it without any endorsement at all,” Franklin said. Former AJCer Doug Blackmon, who supported Amendment One, tackles the topic of African-American support in a piece you can read on line.